Here at CarveWright, we recently had the opportunity to meet one of our customer’s, Travis Palmer. After hearing a small bit of his story, we just had to share. Travis obtained his CarveWright as a gift, but that was small potatoes compared to what else Operation FINALLY HOME (OFH) gave this Tomball, Texas family of 6. As a wounded veteran that served in Germany, Korea and two tours in Iraq, this military hero, Staff Sgt. Travis Palmer, received a custom-built, mortgage-free 5 bedroom 3 bath home. SINCE 2005, Operation FINALLY HOME has provided over 180 homes in 30 states to America’s military heroes and the widows of the fallen, who have worn America’s uniform and sacrificed so much to defend our freedoms and values. OFH expects to build 25 more homes this year and hopes to reach 100 annually by 2018. See the local news coverage of the Palmer family story here. Wounded veteran, Staff Sgt. 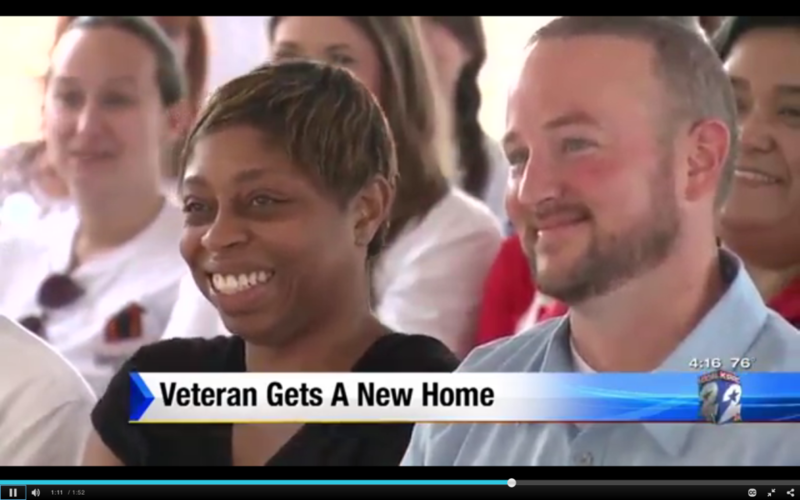 Travis Palmer, received a mortgage-free 5 bedroom 3 bath home through Operation Finally Home. While his home was being built, Travis discovered an old A model CarveWright System that OFH owned, but had never registered or used. 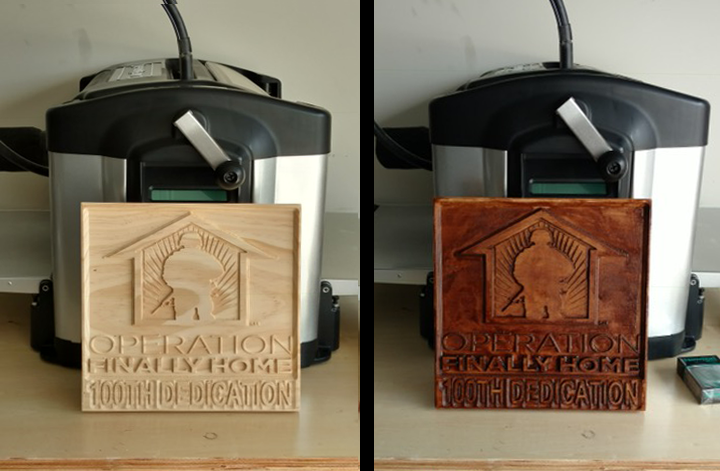 As a way of giving back for the home and organization that has changed his life, Travis took the CarveWright, learned how to use it and put it to work making plaques to go in each recipient’s home. He is, also, looking forward to making Christmas ornaments with the CW to send out as thank you gifts to the many donors who make OFH possible. Travis carves plaques for every wounded soldier who receives a home through Operation Finally Home. After hearing about Travis’ story and OFH, several of our pattern vendors have offered him use of many of their patterns and projects to expand his ability to help. 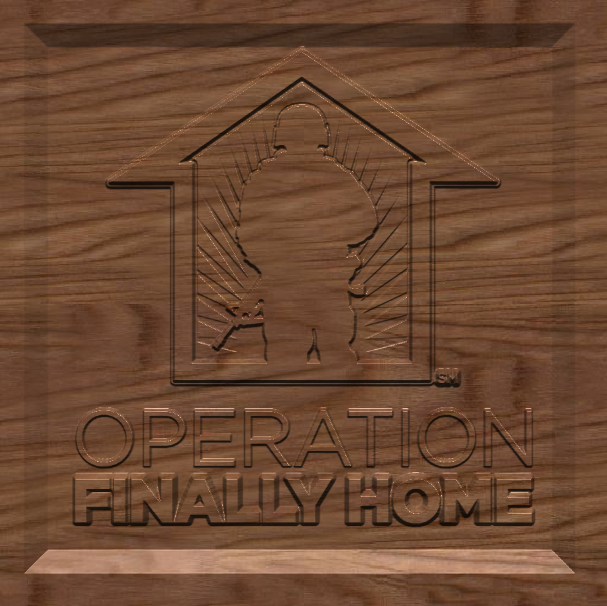 For more information on Operation FINALLY HOME and to donate to this cause, please visit operationfinallyhome.org. that started me making burial flag boxes for them, one side has rank, last, first name. Other side has branch of service with the emblem of their branch. The front is optional with date of birth and date of death. I have made almost 400 of them but only chargdrtked for three. Way to go ssgt. Been there and done that but in Vietnam, dosen’t matter where, we all did our duty and would again. My wife and I just started our business a week ago with nour carvewright machines. fmbm. God bless America. God bless our troops.